Benoit Stos's first visit to Guangzhou was in the mid-1990s, when he was taking a short course in Chinese language at Sun Yat-sen University. Little did he know then that he would eventually return with Mazars, and come to call Guangzhou his home. Benoit Stos is a hands-on manager. As the executive who launched, built up and still oversees the Guangzhou office of Mazars, the French accounting firm, he literally has his hand in every facet of the enterprise's local operations. The 38-year-old Frenchman, who was formerly stationed in Paris and Beijing with Mazars - the only company he's worked for since leaving university 15 years ago - came to Guangzhou seven years ago and set up shop with four employees in the Zhujiang New Town offices Mazars still occupies. "Guanghou is my project," Stos says. As the head of an office that includes 40 professionals (all but two of them Chinese), one of Stos's principal responsibilities is assuring that he has a strong team behind him. That means being meticulous both in the hiring process and also in striving to retain good staff members. He also is intent on assuring that all the reports going from his office to clients - whether audits, accounting work, tax assistance, legal work or business advice - are of the highest quality. Stos takes seriously the quality of the work that Mazars does, because it's a way to distinguish the firm and help it grow its business in the Guangdong region. That's why Stos is heavily involved in business development and finding and enlisting new clients. The effort to seek out new business sends Stos traveling around the region on a regular basis, promoting the Mazars brand. While most of the firm's local business is in Guangdong, Stos also has clients in surrounding provinces. Though planning for the future is a key element of Stos's portfolio, he remains active in Mazars' principal line of work by assisting in auditing projects. He also coordinates the outsourcing work that is needed by a global firm like Mazars. Mazars is a privately held company, with the ownership in the hands of the firm's 750 partners worldwide. Stos is one of those partners, the only one in Guangzhou at the moment, though he hopes it won't be too long before a second partner is named. With offices in 71 countries, Mazars does about one billion euros of business annually worldwide. The firm's four Chinese offices - Beijing, Shanghai, and Hong Kong - all preceded Guangzhou and are integrated and work in tandem, both referring clients to each other and working together on client accounts. The same actually goes for the way Mazars' Chinese operations mesh with the firm's other offices around the world. Mazars is a major accounting firm in Europe, but it has yet to match that reputation in China. So Stos is eager to promote the firm's name and expand Mazars' client list. Currently, all its Guangzhou business is with European and American firms, but Stos hopes to convince Chinese companies of the value of the Mazar brand and bring some domestic businesses into Mazars's fold. Over the next two years, Stos says, "My objective is to double the size of our office." 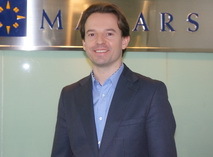 Stos's relationship with Guangzhou began developing before he even joined Mazars. Back in the mid-1990s, people in Paris and elsewhere were full of talk about the amazing growth and dynamism of China. Stos was in school then, so he decided to take a course in the Chinese language. As part of that curriculum, he spent time at Sun Yat-sen University. Little did he know, then, that he would eventually return with Mazars and call Guangzhou his home, living in an apartment building overlooking the Pearl River, just a stone's throw from the Sun Yat-sen campus. When he joined Mazars, Stos's budding interest in Chinese was put on hold. He immersed himself in his work for the accounting firm in Paris. But a little over a decade ago he heard office talk about the firm's interest in Beijing. He talked with the Mazar partner in charge of the Beijing initiative and then let the firm know he was interested in coming to China. In 2002, Stos began working in the Beijing office of Mazars. Often overseas assignments last about four years, but Stos wasn't ready to return to France. He and his wife enjoyed their lives in Beijing and loved traveling around China and in neighboring countries. It was then, in 2006, that the idea was hatched for Mazars' Guangzhou office, since an increasing number of clients were based in the economic hotbed of Guangdong Province. The Guangzhou Stos returned to was not the same city he remembered as a student at Sun Yat-sen.
"It had changed a lot," he says. He had thought it might be difficult to live in the city, but he quickly observed the explosion of hotels and restaurants and culture, the easier life style, and the growth of the foreign community here. "I saw the way life had changed," he relates. While Guangzhou might not be as cosmopolitan as Beijing or Shanghai, "it's more relaxed," he says. "Life in Guangzhou is easier than in Beijing." Another difference he has noticed is as Beijing has grown and opened up to westerners, it has lost a little of its Chinese flavor. Guangzhou, on the other hand, "is still more Chinese," Stos believes. He has become active in the commercial life of Guangzhou, sitting on the board of the European Chamber of Commerce and mixing with other foreign business leaders. He also meets regularly with local authorities to discuss tax, labor, customs, and visa issues that effect western concerns doing business in Guangzhou. Stos has developed a comfortable relationship with the Chinese in the city and believes the region's economy is still dynamic and a good place for many western firms, especially those already established here, to do business. That doesn't necessarily mean, though, that all is completely perfect for a Westerner who enjoys immersing himself in the Chinese culture. Stos has three children, aged 2, 9, and 12. While the older ones attend a French school in Guangzhou, Stos and his wife must make a decision faced by many westerners with children in the city. What should they do when it comes time to send their kids to high school? The city's secondary schools are still not of the quality many westerners seek out for their children, so Stos will have to make the hard choice of whether to return to France or remain in a city he has come to call home for the past seven years.